Hello and welcome to our group. This group is still under construction, feel free to contribute to the group by joining or submitting art. A group based around the surreal RPG Maker game "Yume Nikki," created by Kikiyama. 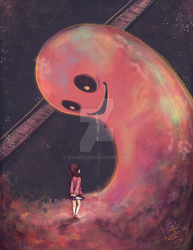 This group is here to try and help Yume Nikki get more fans by sharing amazing art. Unlike some other groups, we categorize by character, not by traditional/digital etc. If you want an NPC to have its own art folder, comment and it will be added. if you have any uboa art that you can submit, please do! for one of the most iconic characters in the game, they certainly deserve more art in their fairly empty folder. if you could even draw some new uboa art to submit, that'd be great too! thanks! however, they are not in the original file. the original file is hardly 4 seconds long, and my speculation is that moonwindow00 went in-game, traveled to the sky garden, and recorded the audio using a program like audacity. they also recorded background noise in the process, capturing other people talking. Hello, can I join this group as a normal member? I can't join as a normal member either. It only let us join as an administrator... ? for some reason. I'd like to join the group! sorry for late reply! i sent one! if you're still interested please reply to let me know and i'll send an invite again as soon as i can!